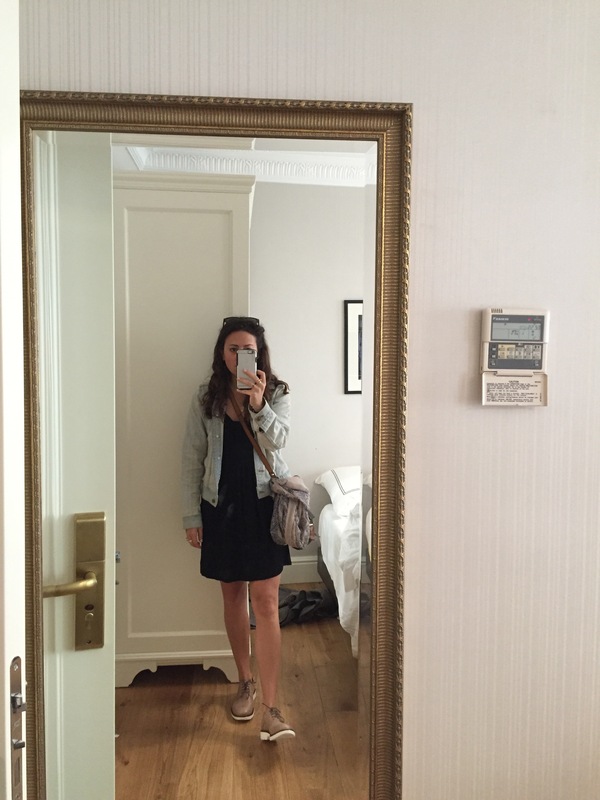 As you readers know, this was my first time to Istanbul, but my parents have been many times. As such, they did a lot of driving the itinerary, so I didn’t have to put a ton of research or effort into figuring out the main places to go and things to see. It made for a super easy and relaxing few days. We stayed in a small hotel called Nar Galata, located in the district of Beyoğlu, on the European side of Istanbul. 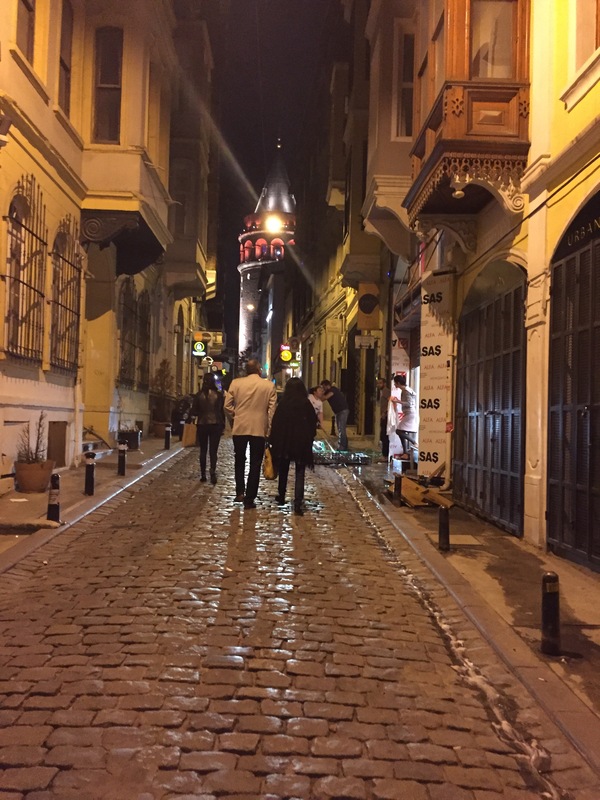 We stayed on a quiet and charming little side street in between Istiklal, one of the main shopping streets in Istanbul, and the Galata Tower, a medieval tower that is one of Istanbul’s most striking landmarks. Situated within a short walk of the Golden Horn, it was the absolute perfect location to be in, and made nearly everything we wanted to see and do accessible by foot. During our three and a half days there, we took the metro once, to go, at the request of my teenage sister, to the Cevahir mall, allegedly Europe’s largest. 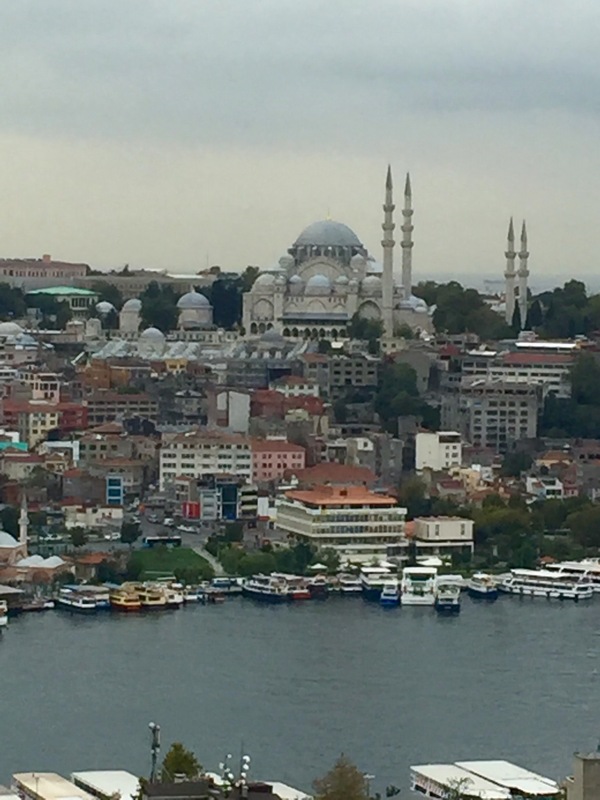 Beyond that, we walked about 10 miles a day (which made me feel better about the constant stream of food I was eating), and managed to cover a good chunk of Istanbul that way. Many of the roads are cobble-stoned in the historic areas of the city (including our hotel street), so make sure to bring shoes you can walk in comfortably. Cobblestones streets near our hotel leading to Galata Tower. Feat. my cutsie patootsie parents and little sis. Beyoğlu is a wonderful combination of old and new, and the perfect home base if it’s your first time in the city. Galata Tower, the hilly cobbled streets, and the historic buildings (our hotel was in an old Ottoman mansion) juxtapose the bustling and cosmopolitan Istiklal Caddesi, a modern, mega-chain brand laden shopping street that could have been in any major city in the world. 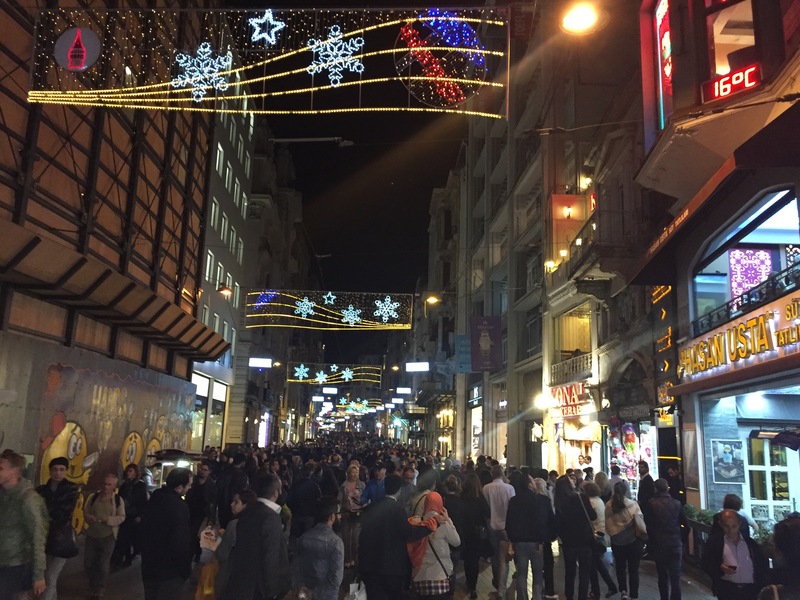 All the major high street shops line Istiklal, and on a Friday night, the wide street was packed nearly shoulder to shoulder with foreigners and Turks alike enjoying a bit of shopping and dinner out. What I also found surprising in a Muslim country that has been dominating the news with its stories of its increased conservatism, was that Istiklal, and for that matter, most of Beyoğlu, appeared to have an open bottle drinking policy. SO many people, mostly young, were drinking in the streets with groups of friends, and at the restaurants, bottles of beer, and raki, a clear anise alcoholic drink that turns milky white when served with chilled water and ice cubes, flowed freely. “Open air” restaurant that was basically closed air if we’re being honest. But hey, let’s smoke some cigarettes. Istiklal Caddesi jam packed with people on a Friday night. The cafes stay open quite late into the night, and the weather in October is still warm, which allowed cafe-goers to take a cup of coffee or tea and some dessert sitting outdoors and enjoy the city lit up at night. 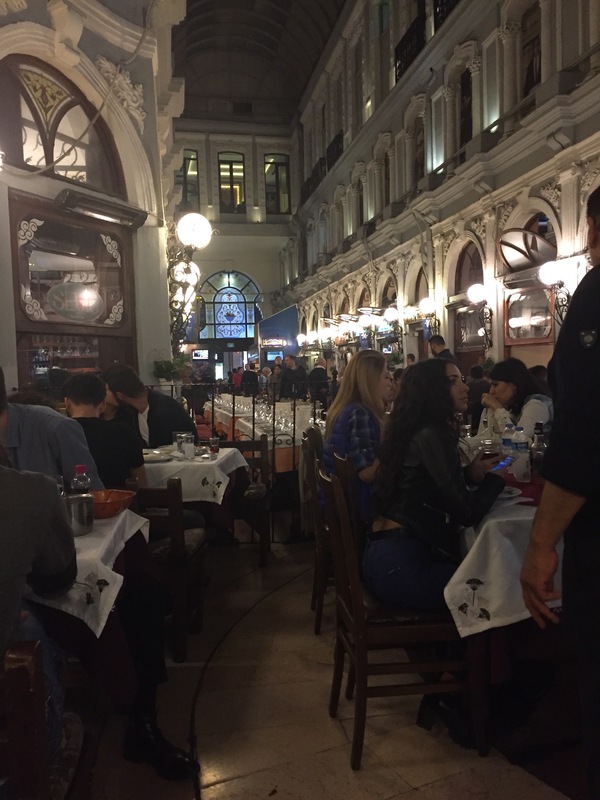 Our hotel also had a fully functioning cafe open to the public on its first floor, and we’d come back late in the evening to find the place packed with travelers and locals enjoying a cappuccino and a cigarette in Istanbul’s evening air. In Istanbul, smoking laws seemed to be pretty lax as well. You couldn’t smoke inside a fully shut restaurant, but a cafe with large open door-windows and/or a semi-open air restaurant seemed to be fair game. 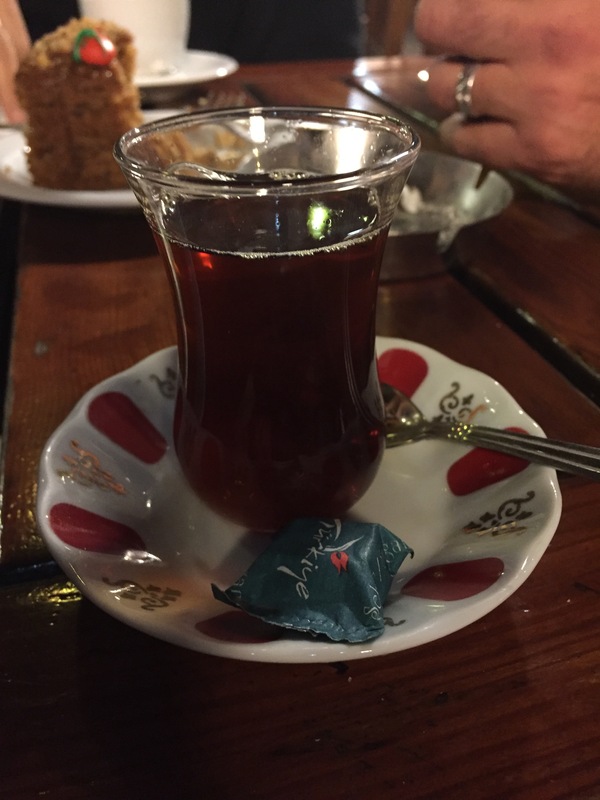 My life source for 3.5 days- Turkish tea. The Turks take their tea black, served in a lovely glass tulip cup, with a sugar cube on the side. The people who worked at our hotel showed me that the tea is actually a tea concentrate. You fill the tulip glass about a third of the way full and then top off with hot water. This one was consumed late at night at an outdoor cafe near Galata Tower on our first night in Istanbul. The Nar Galata Hotel, where we stayed, isn’t exactly a budget 18-man hostel room option, but I still think it’s definitely worth a look. It cost about 50 euro a night per room, which, if split with a friend, or even two depending on the room, makes it well within a reasonable budget. Because it’s a converted mansion, it only has limited capacity in terms of space; I think there are about five rooms in total. The room that my sister and I stayed in was a slightly odd configuration, three double beds in a row, so splitting the cost between three people would definitely be possible, and at that point, you’re paying under 20 euro a night. My parents’ room was quite small, but for only three nights, was more than adequate, and all the rooms were nicely decorated, and stocked with bottled water, instant tea, coffee, and an ample supply of bath toiletries. The hotel itself had character and so much charm. The location was absolutely fantastic; I cannot speak highly enough of how perfect of a neighborhood it was to be in when visiting the city for the first time. They just opened as a hotel in early 2015, so they were still working out some kinks, but overall it was a great experience. The hotel staff was attentive, the rooms were clean and comfortable, and most importantly, they had a WONDERFUL full Turkish breakfast. I mean, the breakfast was worth a good chunk of the value of the price per night alone. In addition to a full spread of cheeses, pastries, bread, jams, fresh cut fruit, hot plates of eggs and sausage, cereal, and Turkish tea and coffee, you could also get omelets and other delicious egg dishes made to order. The chef made batches of fresh warm Turkish breads for breakfast each day that one of the staff would bring around, and we got to try a new bread each morning straight from the oven. And guess what? It’s FREE. That’s right, the breakfast came free with the cost of the room. And man, was it a lovely way to start the day. Beyoğlu was charming and ancient, modern and clean, and cosmopolitan yet quaint. It had a predominantly European vibe architecturally, and yet, I woke up at the break of dawn to the sound of the muezzin calling out the athan for fajr prayer from the minaret of a nearby mosque. The neighborhood encompassed what I saw to be the essence of Istanbul: old meets new, East meets West. It was a fascinating combination.